RO/DI (deionized) water Houston Texas- a beginner’s guide. Hey guys- This is a topic of conversation that has come up recently and we, of course, thought about sharing it here. So, what is RO / DI (deionized) water and what are some of its applications for us here in Houston Texas.? Well, for bigginers, DI water is simply water whose ions have been removed. That is the basic answer. An ion is a molecule with a particular charge (positive or negative) which means that the number of electrons do not equal the number of protons. Side note: This stuff is fascinating now… not in my college days. Moving on, let’s take a look at regular water, tap water to be more specific. Tap water runs underground , correct? This is very reason why tap water usually carries lots of ions from the earth and pipes. In chemistry classes, DI water is preferred and the reason is that the ions in the water will cause interference and it will be more electrically conductive. Looking at diesel exhaust fluid (DEF), we all know that DEF is made up of 32.5% urea and 67.5% DI water. 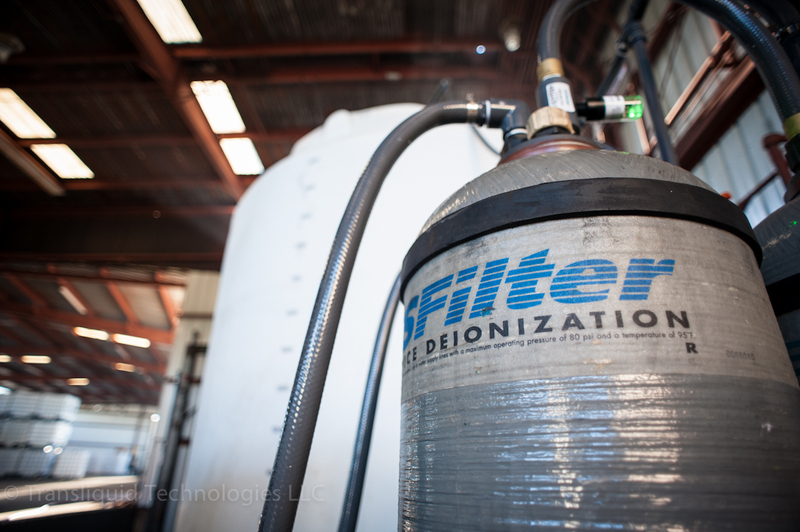 Why do we use DI water to blend diesel exhaust fluid here in Houston Tx? Well, we already established that DI water is water whose ions have been removed. Taking this further into DEF territory, what we are doing is removing the mineral ions. If you take a look at the ISO22241 standard for DEF you will notice the list of minerals whose total content need to meet a low ISO standard. The minerals include sodium, calcium, iron, copper, chlorides, and others. High metal content and DEF do not go hand in hand. The brief description for the system is as follows: City water enters the premises, it then goes throught salt first, followed by charcoal filters, softner filters, Reverse Osmosis, DI system, one last set of final filters to produce very high quality DI water. So, when we produe DI water for sale in either bulk quantities or smaller IBC tote quantities, all these things are taken into consideration and now you know what goes on behind the scenes. Our water system can run 24 hours a day, conveniently located in Houston Texas. Age and wear indicators: Aluminum, calcium, chloride, copper, formate, glycolate, iron, magnesium, lead, sulfate, zinc. Detection limits are typically 1mg/l or 1ppm. 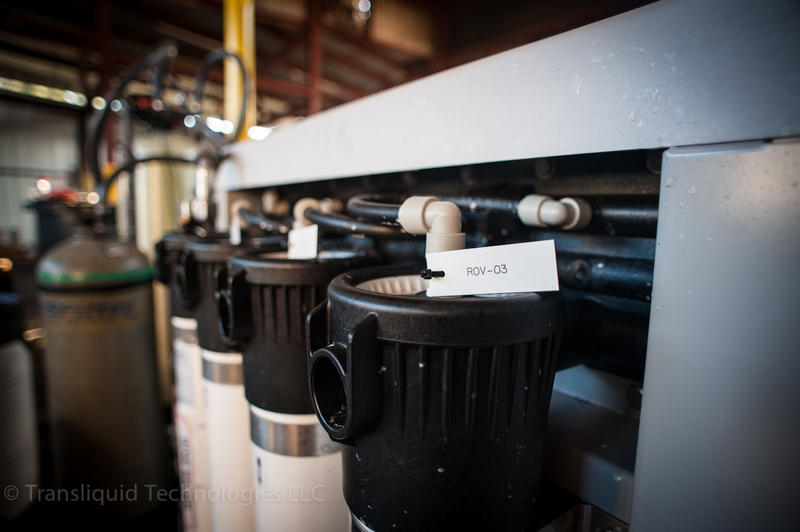 Our water goes through a (DI)deionizer and (RO)reverse osmosis system. We will be happy to provide you with our certificate of analysis. Hey guys- is everyone enjoying the little bit of fall that are starting to experience? We have been truly enjoying some beatiful weather in the space city. This naturally gets me in a good writing mood. Ok, so we are introducing a very special product this week which has had a heavy battery of internal tests from our very own team. 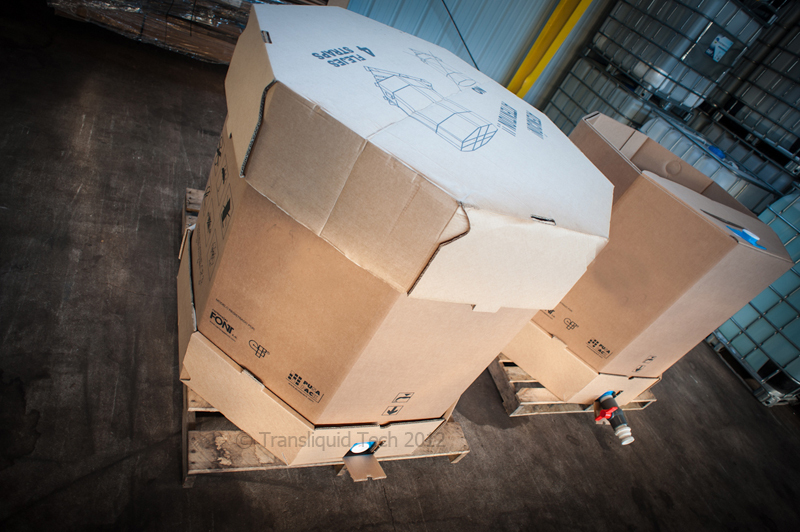 I am not certain that you realize that Transloading and packaging has been a very interesting part of our business. 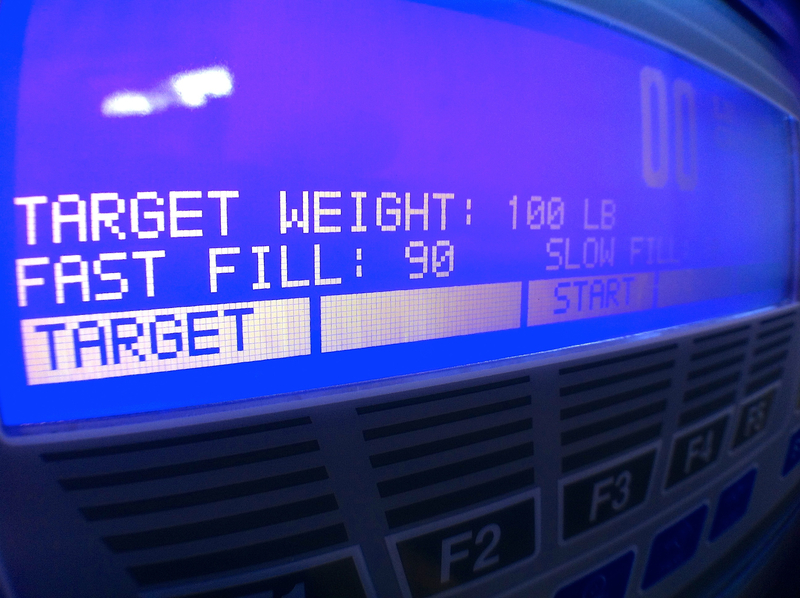 When it comes to IBC Totes, bulk liquid transfer totes, chemical drums, etc… we have been staying on top of this. Traditionally, we all know the standard IBC Tote. These are purchased either as new or used IBC Totes for different types of chemicals, as part of the packaging services being offered. We also know that Houston serves as hub for chemical packaging, in forms of bulk chemical packaging, intermediate bulk chemical packaging, drum packaging, and transloading for various liquids and solid chemicals right here in Houston Texas. But today, we introducce a new design into the chemical packaging industry. The concept has been around but this new design is unique, separating itself from the rest. We are very excited to introduce not only the following new product, but a new partnership with CartonajesFont with the ODL 1000 IBC Tote and related product line. The fast fill IBC/ODL 1000 is a collapsible IBC container with a capacity of 1000 liters (264 gallons) dedicated for the storage and transportation of one way liquid and solid products. The Fast Fill IBC/ODL 1000 is constructed of heavy duty cardboard with a simple and reliable approach. Space is always a concern for tradional IBC’s. Not with the Fast Fill IBC/ODL 1000, you can save 80% of floor space with this new type of IBC. As you will see in the video below, the assembly is where the magic happens. Our competitors cannot touch this patented design, we are sure that you will agree with us. Some of the highlights include a 2″ NPT fill port, 2″ NPT discharge with built in cutting tool. (see video for explanation), and a superb built-in support bridge. All built ready to be quickly assebled without having to purchase additional items. The dimensions will allow you to ship 20 units in a 20ft container. The combination of a competitive uni price, single trip design and maximum utilization of a container space, makes this an extreme cost effective way to ship your product. Folding container to single use. 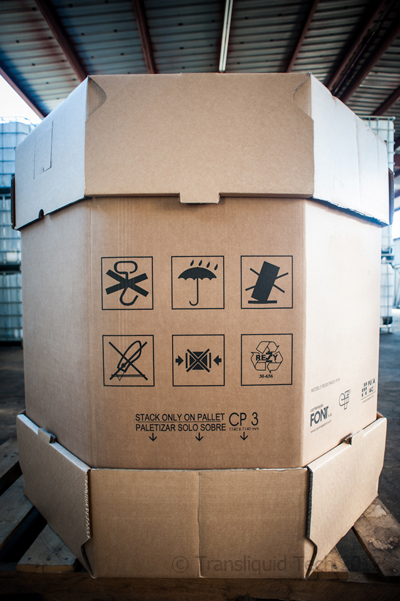 No refund, no maintenance or cleaning any IBC totes. The bag provides better organoleptic product conservation. 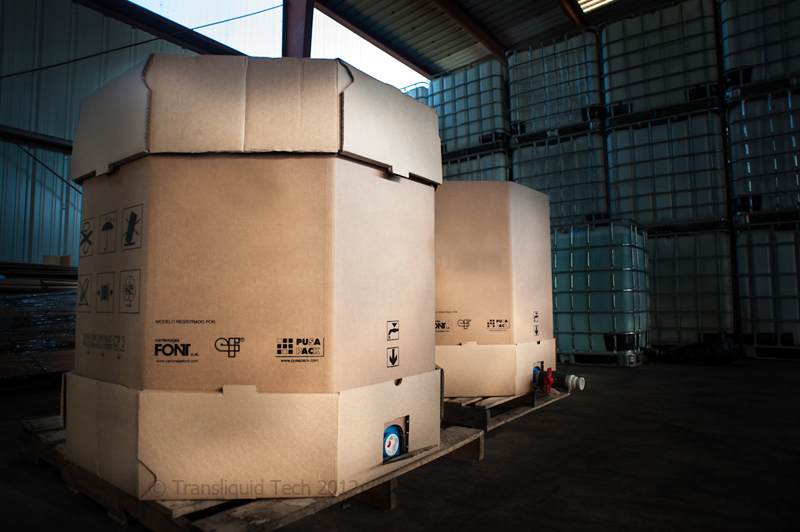 So, if you are looking for distribution, quality chemical transloading, druming into ISO tanks, packaging by totes, Flexitank transloading, bulk to drums, and general liquid bulk transfer here in Houston Texas. We are here to help you! Our domestic and international reach can help you service many markets. 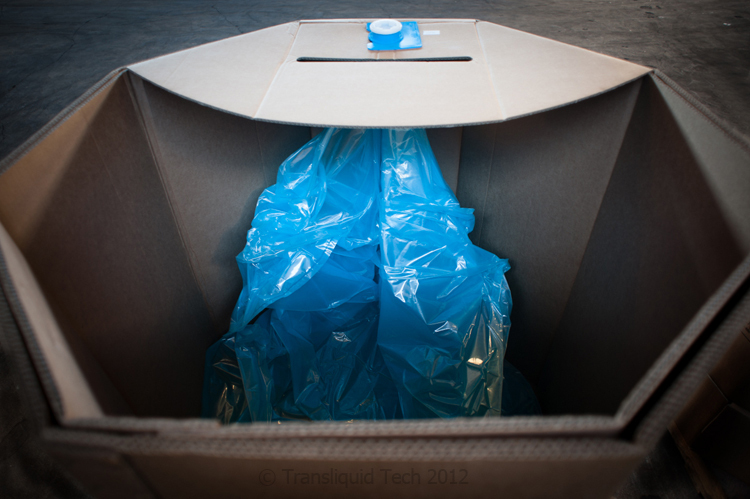 Call us at +1-281-377-5845 or email us at info@transliquidtechnologies.com for a fast quote.